COPS top boys and top girls at the Cambs County Championships. From the left they are Connor Walker, Josh Martin, Henry Pearce, Matt Newson, Ella McGhie, Ruby Blakeley and Eve Wright. City of Peterborough Swimming Club (COPS) were once again the dominant force at the 2018 Cambridgeshire County Championships. They finished the championships - spread over four weekends - well ahead at the top of the medal table with an impressive 79 golds. Pictured is the COPS British Championship squad who will be competing in Edinburgh this weekend. From the left they are, back, Myles Robertson-Young, Tom Wiggins, Jamie Scholes, Matt Grey, middle, Eve Wright, Kenzie Whyatt, Mia Leech, Herbie Kinder, Henry Pearce, front, Emma Leslie, Poppy Richardson, Amelia Monaghan, Lauren Harrison and Harry Whiteman. Missing from the picture are Ella McGhie and Rachel Wellings . There were 12 ‘Top Swimmer’ trophies up for grabs for the best boys and girls in six different age groups and COPS collected eight of them. The COPS swimmers to dominate their age groups were Olivia Mahoney (11) , Ruby Blakeley (12), Josh Martin (13), Connor Walker (14), Ella McGhie (14), Eve Wright (15), Matthew Newson (15) and Henry Pearce (16). The championships also included popular skins events where the fastest eight swimmers across the county competed in a series of 50m elimination races until the winner was left standing. And these too were dominated by COPS. They had the top three boys in the shape of Jamie Scholes (1st), Myles Robertson-Young (2nd) and Herbie Kinder (3rd) and it was a COPS 1-2-3 for the girls as well with Rebecca Burton first, Amelia Monaghan second and Poppy Richardson third. 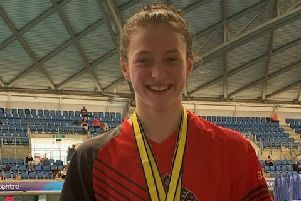 Ruby Blakeley won 12 gold medals. COPS also had one of the youngest ever competitors in skins in the shape of 13 year-old Ella McGhie. Head coach Ben Negus said: “It was an awesome job by everyone at the county championships this year. “To finish top of the medal table by a considerable margin and win eight of the 12 top swimmer awards was a fine effort. “This outstanding squad achievement to me is all the more pleasing given the swimmers trained two hours early doors every Saturday morning at 6am before going on to race at the championships. They were not rested. “If I’m honest the relays didn’t go the way we wanted, we finished second overall to Cambridge, but the swimmers across the championships showed great racing ability and it is very pleasing for the coaches to see our younger swimmers showing such great technique and race ability. Several of the club’s swimmers were using the championships as a warm-up for the British Championships, which are in Edinburgh this weekend. Sixteen COPS swimmers have qualified to compete in the UK’s premier event which will feature all the Team GB swimmers . More than 500 swimmers will be in action including Olympic and world champion Adam Peaty, world champion James Guy and Olympic medallist Siobhan-Marie O’Connor. It will be their final meeting before heading out to Australia’s Gold Coast for the Commonwealth Games in April. Ella McGhie from COPSCOPS, who is still only 13, is likely to be the youngest competitor.